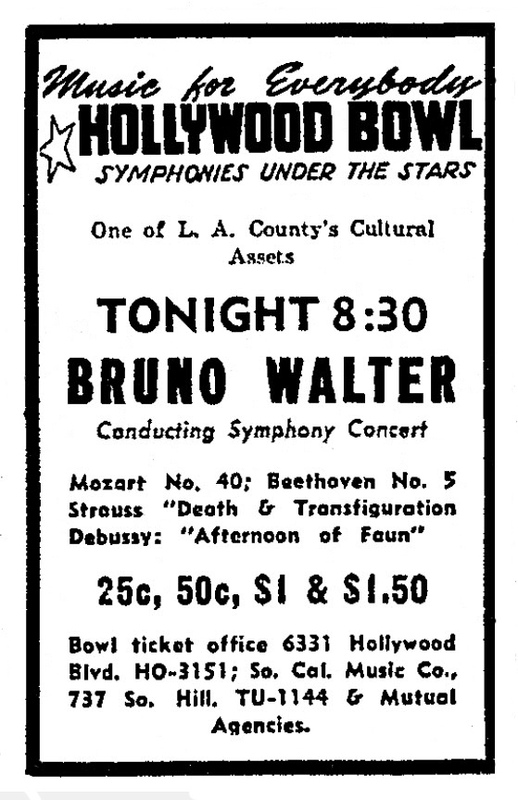 On Friday, July 11, 1941, German composer Bruno Walter was scheduled to conduct the Los Angeles Philharmonic Orchestra at the Hollywood Bowl, as part of the "Symphonies Under the Stars" program during the opening week of the Bowl's 20th season. The evening's program of music, scheduled to start at 8:30 p.m., would include Mozart's "Symphony No. 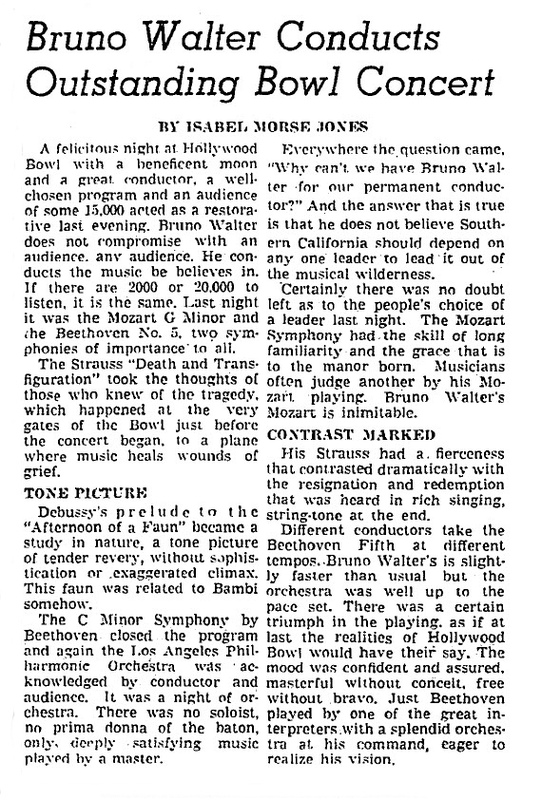 40," Beethoven's "Symphony No. 5 in C Minor" and Debussy's "Afternoon of a Faun." The orchestra was also scheduled to perform a piece by Richard Strauss titled "Death and Transfiguration," which musically depicts the thoughts going through the mind of a man as he lies dying and recalls the events of his life. Outside the Bowl, before the start of the program, LAPD Officers Ferris Stansell, 43, an 18-year police veteran, and Charles E. Ritchie, 49, were directing traffic on Highland Avenue into the Bowl. An estimated crowd of 15,000 was expected at the outdoor venue. Stansell was born March 12, 1898, in Tustin, Michigan, in the northwestern part of the state, the youngest of five children of Charles, a farmer, and Mary Steward Stansell. When Stansell was a child, the family moved to Eureka, Montana, where Charles Stansell worked in a saw mill. By 1920, Stansell joined the U.S. Navy, and served on the U.S.S. Helena, a gunboat based in Hong Kong to protect U.S. interests around China. Following his military service, Stansell moved to Los Angeles and joined the LAPD in 1923. At about the same time, he married Marie Labrucherie, a telephone operator. Shortly after he started on the force, on Aug. 31, 1924, Stansell was injured when the police ambulance he was driving was struck by a car at the intersection of Main and Commercial streets. Stansell suffered minor cuts and bruises. 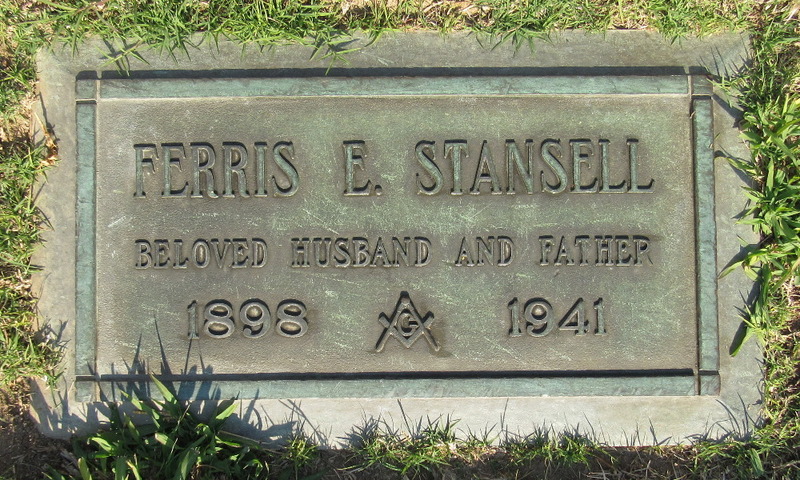 In about 1930, Stansell’s parents moved to Los Angeles, and lived with Stansell and his wife in their home on West Boulevard. Charles Stansell worked as a salesman before he retired. He died on Sept. 24, 1934, at the age of 79. Ferris and Marie Stansell's only child, Eleonore Rita Stansell, was born on Feb. 11, 1935. On that Friday evening in July 1941, on Highland Avenue in front of the Hollywood Bowl, Officer Ritchie heard the speeding car before he saw it. "I looked around and turned to shout, 'For God's sake, look out, Stan,' then the car hit him and knocked him nearly 100 feet," Ritchie recalled. Stansell was pronounced dead at the scene, leaving behind his wife and 6-year-old daughter. After hitting Stansell, the car left skid marks of more than 100 feet. The driver, a 21-year-old riveter at an airplane factory, admitted to police that he was traveling "something over 50 miles per hour." Other witnesses confirmed that the car was going at least that fast. The driver was arrested on suspicion of negligent homicide, but there was no report in the newspapers about the outcome of the charges against the driver. Episcopal and Masonic funeral services for Stansell were held at the Pierce Bros. Chapel. The American Legion Post of the Police Department conducted graveside services at Forest Lawn Memorial-Park in Glendale, California, with members of the Police Department Band serving as pallbearers. After Stansell's death, his widow, Marie, worked a series of jobs. "I couldn't tell you all the kinds of jobs I took to keep us going," she later recalled. "I was born right here in Los Angeles, at Washington and Crenshaw boulevards. My father was a rancher. You've heard the old saw, 'Sometimes we ate chicken and sometimes we ate feathers' -- so I didn't care how hard a job was to stretch my police pension, as long as it was honest." Marie Stansell worked for the LAPD as a telephone operator from 1928 until Eleonore was born in 1935. In 1946, five years after her husband's death, she returned to the LAPD as a school crossing guard, working at the intersection of Noble Avenue and Roscoe Boulevard. In later years, she worked for five hours per day at various intersections throughout the San Fernando Valley. Even though she received a police pension, Marie Stansell wanted to earn enough money to take care of Eleonore. "I was determined to send her through college with no help from anyone," she said. Eleonore Stansell graduated from UCLA, and later worked as a junior high school teacher in Lomita, California. 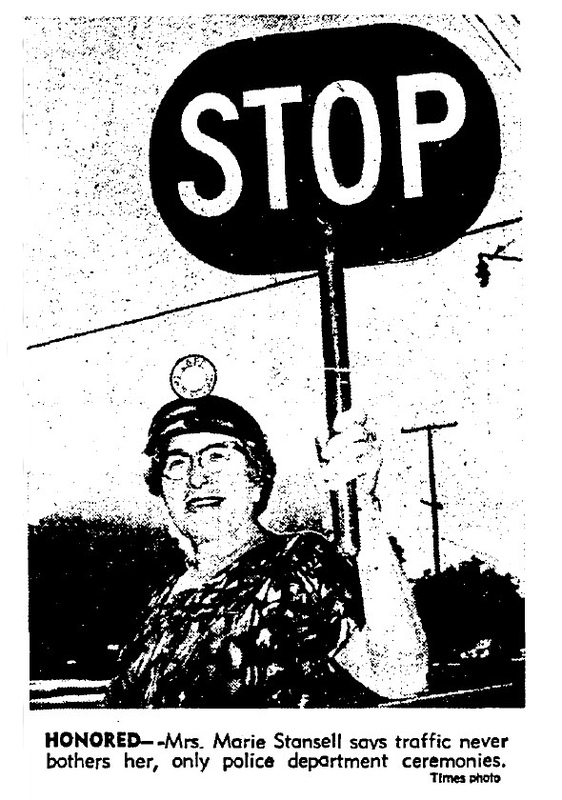 In 1971, the Los Angeles Police Commission honored Marie Stansell for her 25 years of work as a school crossing guard. After her husband was killed by a reckless, speeding driver, Marie Stansell dedicated most of the rest of her life to protecting two generations of young students from the same dangers. Under her vigilant watch, every student got to school safely and returned home safely, with no traffic accidents or injuries. 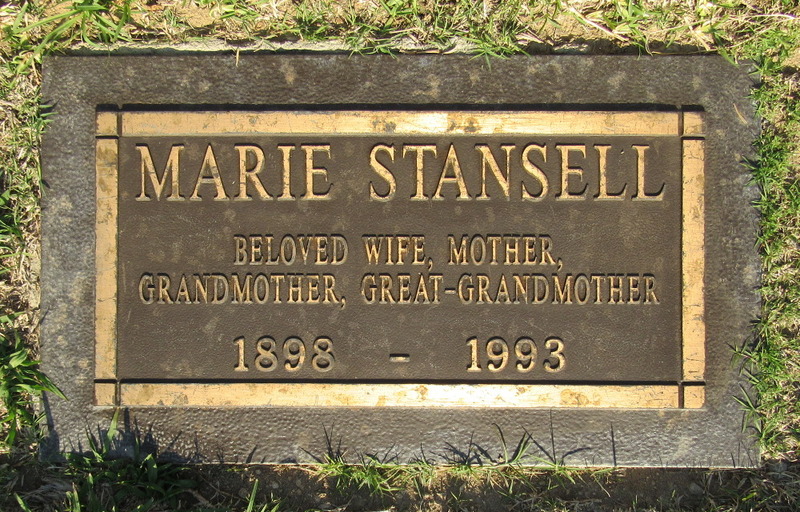 Marie Stansell died on Dec. 19, 1993, at the age of 95. She's buried next to her husband at Forest Lawn in Glendale. 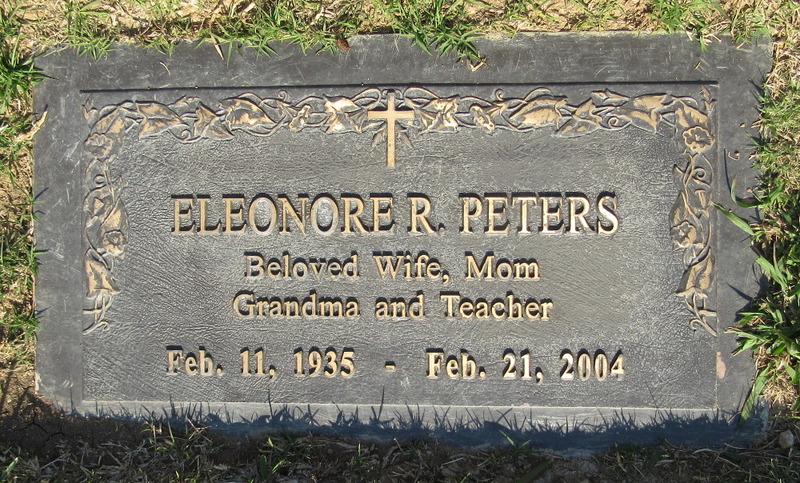 Their daughter, Eleonore Stansell Peters died in Garden Grove, California, on Feb. 21, 2004, at the age of 69, and is buried with her parents. Stansell's sign is located in the median on Highland Avenue at Pat Moore Way, directly in front of the entrance to the Hollywood Bowl.